One of the most important steps in launching or expanding a venture is the creation of a business plan. The absence of a written business plan can lead to failure for new businesses, and inhibit growth and development. 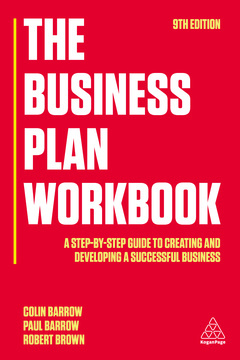 Based on methodology developed at Cranfield School of Management, The Business Plan Workbooktakes a practical approach to the topic of business planning. Perfect for those growing businesses, as well as a range of academic and professional courses, this title takes the reader step-by-step through each phase of the development of a business plan, from creating a competitive business strategy to its writing and presentation. With 29 corresponding assignments that each includes case studies such as Hotmail, Cobra Beer, IKEA and Amazon, actively engaging questions and worksheets, it will enable you to validate your business idea, brand your business, research your market, and raise finance. This new edition includes an additional assignment covering online content, key words, SEO, Social Media, traffic tracking, affiliate marketing and online advertising. With a range of fresh case studies including BrewDog, Chilango and Honest Burgers, this fully updated ninth edition of The Business Plan Workbook is an invaluable and comprehensive guide to all aspects of business planning. Online supporting resources for this book include lecture slides, test questions and answers, and a new guide to online courses, lectures and case studies. Colin Barrow has lectured in business schools in the UK, America, Australia, the Far East and throughout Europe and is currently a visiting fellow at Cranfield University. He is also the author of The 30 Day MBA series,Financial Management for the Small Business and Starting a Business from Home (published by Kogan Page). Paul Barrow is a Visiting Fellow at Cranfield, and also a consultant advising SMEs on growth strategies. Robert Brown is a Visiting Fellow at Cranfield and directed the Graduate Enterprise Programme there, where he led a course on entrepreneurship.